Thank you for joining us Thursday, March 21 for an exclusive SSH conference call with David Stearns, as the Brewers General Manager discussed the latest developments from Spring Training, expectations for the upcoming season and the overall state of the organization. The foundation has been laid and the cornerstones are in place. There is no doubt we're building something special here in Milwaukee. And as we look forward to the 2019 season, we invite you to get on board with the Crew as a Brewers Season Seat Holder. Join us as we continue to reach new heights, and be there every step of the way as we strive to bring a championship home to Wisconsin. Will I receive a refund for Postseason games not played? Will I receive a refund on the handling and fulfillment fee? As a SSH, you receive top seating priority and are guaranteed the best seats for every game in your plan. Last season, SSHs saved as much as 43% off the demand-based ticket price. Enjoy a variety of spectacular rewards available only to SSHs -- such as exclusive insider events, one-of-a-kind ballpark experiences, and more! Your personal Account Executive is available to answer questions, help with exchanges, and provide assistance at any time. During 25 select games, SSHs will enjoy 25% off concessions & merchandise, plus receive early access to Miller Park to watch Brewers batting practice. Can't make a game in your plan? Missed a game? Exchange active or unused tickets for future games with one of the most flexible exchange programs in sports. Enjoy access to exclusive events, such as a SSH Luncheon, conference calls with Brewers executives, and more! Make sure to stop by this exclusive area inside the ballpark where you can meet your rep, get questions answered, and enjoy special perks, such as seeing your name on the SSH Wall of Fame. SSHs will receive a limited-edition SSH Lorenzo Cain "Show Me Some Love" Bobblehead -- featuring the All-Star outfielder in his Players Weekend uniform. Guarantee your spot for all Postseason games played at Miller Park. Save on parking by purchasing in advance at a discount off the general-public price. Receive first access to additional single-game tickets, as well as other marquee events at Miller Park including concerts, sporting events and more! Enjoy the upscale environment of the Northwestern Mutual Legends Club through the exclusive Northwestern Mutual Legends Club 4-Pack - available only to SSHs. Go paperless by accessing your tickets through the MLB Ballpark App. Receive a FREE standard subscription to MLB.TV, which includes all the premium features of MLB At Bat--a $120 value. Returning for the 2019 season, our SSH Rewards Program gives Brewers SSHs access to even more exclusive benefits, insider events, and one-of-a-kind experiences. Customize your membership by selecting the rewards that are most important to you. To select your SSH Rewards, you can either rank your preferences online via your personalized SSH Renewal Website (which was sent to you via email), or complete the SSH Rewards Order Form and mail to the Brewers Season Ticket Office. Some rewards have limited capacities and will be granted based upon tenure and date of renewal. Renew by 9/27/18 for the best chance at receiving your preferred rewards. Season Seat Holders who own multiple plans will receive one set of rewards based upon the plan with the most games. Ticket Brokers (those that re-sell the majority of their tickets through the secondary market) are not eligible to participate in the SSH Rewards Program. We are excited to once again offer a variety of Season Ticket Plans for the 2019 season - including Full-Season, Half-Season, and 20-Game Fixed Plans, as well as the customizable 20-Game Fan's Choice Plan. Click the plans below to view the games included in each plan. If you would like to change your plan for the 2019 season, please contact your Account Executive. Once again in 2019, Brewers SSHs will enjoy 25% off food and beverage, 25% off merchandise, and early access to Miller Park to watch the Brewers take batting practice during 25 select games. 25% discount will be rounded to the nearest quarter. Additional restrictions apply. It is not guaranteed that the Brewers will take batting practice before each game. Early admission to Miller Park can be accessed only via the 3rd Base Gate. Merchandise discount available at the four Brewers Team Stores located in Miller Park (certain merchandise exclusions apply). Full Season, 40-Game and 20-Game Season Seat Holders will receive a SSH ID Card in the mail prior to the first SSH Appreciation date. Each SSH must present their ID Card and game ticket at time of entry. This ID Card must also be presented at the time of purchase to receive food, beverage and merchandise discounts. No exceptions or substitutions. Food and beverage discounts are not available from in-seat vendors, Heavenly Roasted Nuts and Holey Moley portable stands, in All-Inclusive Areas, in Suites, in the Johnson Controls Stadium Club or at Friday's Front Row Grill. Discounts are non-transferable and cannot be combined with other discounts or offers. During the early entry period, a concession stand will be open behind home plate on the Field Level. All other concession stands will open at the general public gate opening time. During the early entry period, fans will have access to the Field Level along with the Loge Bleachers. All other ballpark areas will open at the general public gate opening time. *Note - If you'd like to pass along the early entry opportunity to share partners, family members or others, feel free to utilize the extra early entry pass in your Season Seat Holder Handbook. That pass is good for up to 4 additional people to gain early entry along with their game ticket. Can't make a game in your plan? Not to worry - as a Brewers SSH, you enjoy one of the most flexible ticket exchange programs in all of sports! If you know in advance that you are not able to attend a particular game, you can exchange your seats and parking for 49 select future games for just $1 per ticket. If you missed a game in your plan for any reason, you can exchange unused tickets for Terrace Reserved seats to 37 select future games for just $1 per ticket. Note - Some restrictions apply to Loge Level Double Play and Terrace Ticket Treat accounts. Exchange dates are subject to change. Ask your Account Executive for details. 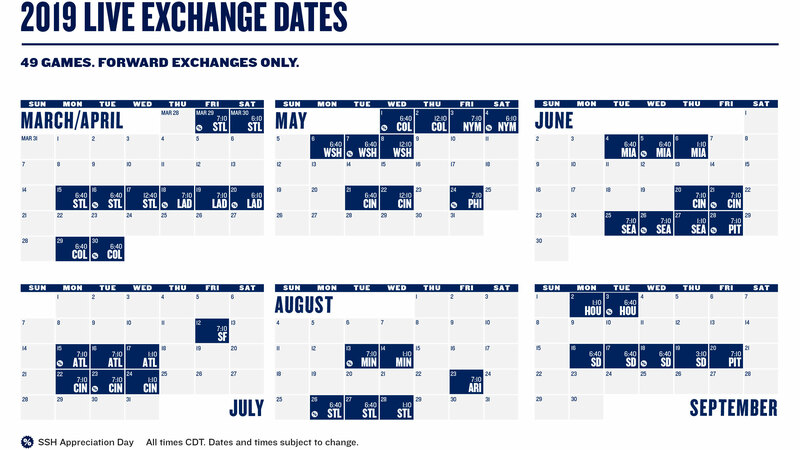 Exchange your season tickets in-person at the Miller Park Box Office. Physical tickets are needed to complete the exchange. Box Office hours are extended during home games. Season Seat Holders have the option to exchange tickets and parking passes to 49 selected future regular season home games. Excludes: Opening Day, Sundays, most Saturdays and Cubs games. See the accompanying schedule for exceptions offered. All tickets must be exchanged for a date occurring AFTER the date of the ticket being exchanged (e.g. September tickets cannot be exchanged for games played earlier in the season). A $1.00 per ticket service fee will be applied to all exchanged tickets and parking. This is a ticket-for-ticket exchange and tickets may be exchanged only ONCE. The Brewers will provide tickets in the same or similar price category (subject to availability). Original tickets must be exchanged at least 48 hours in advance of the game date on the original ticket. A maximum of eight tickets can be exchanged for any one particular game. Each unused ticket from a past game will be exchanged by the Brewers for the best available location in the TERRACE RESERVED only. Once again this season, you can enjoy spectacular rewards for referring your friends and family members! Check out the complete list of rewards below and contact your Account Executive to make a referral. *Field Diamond Box ticket offer excludes Opening Day and all games vs. Chicago Cubs. Any Brewers Ticket Plan Holder of 10 games or more is eligible to participate in program. Referral account must be signed on and paid in full by March 27, 2019 for referrer to receive rewards. Only ticket revenue from new ticket plans of 10 games or more will be counted toward value of referral. Parking revenue is not included. Program does not apply to resellers. Ticket Plans that are transferred between accounts will not be acknowledged as a referred ticket plan. Program available for Account Holder of record only. Rewards will be distributed in April. Field Diamond Box ticket offer excludes Opening Day and all games vs. Chicago Cubs. Autographs subject to player availability. If you are a current Brewers SSH, you should have received an email with a link to your 2018 Postseason Ticket/2019 Season Ticket Renewal site. If you did not receive this email, or if you have any questions regarding the renewal process, please contact your Account Executive. Early Payment Option - Special Early Payment Gift! ^ First payment will be processed upon receipt of Postseason commitment by September 6, 2018, or if you choose not to purchase Postseason tickets, your payment will be processed when received prior to the renewal deadline of September 27, 2018. You can conveniently submit payment and renew your plan online through your My Brewers Tickets account. Log in to your account by entering your Brewers.com account # and password. Your account balance will auto-populate based on your 2018 ticket plan. 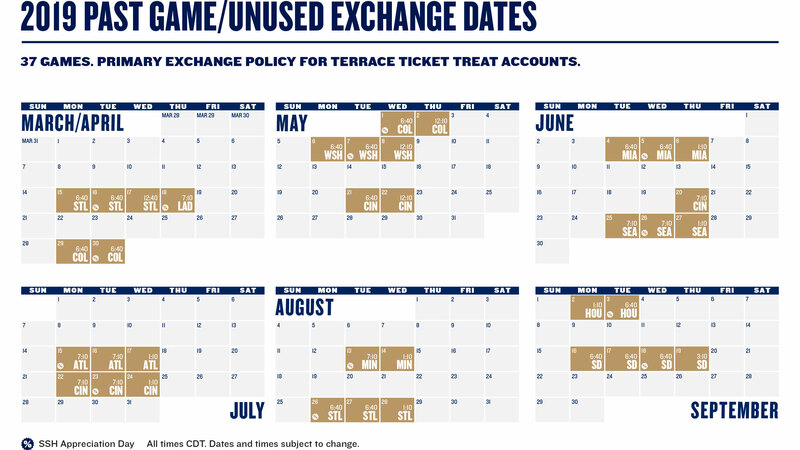 If you have any questions about this process, or if you would like to change your plan for 2019, please contact your Account Executive or call the Brewers Season Ticket Sales Office at 414-902-4100.